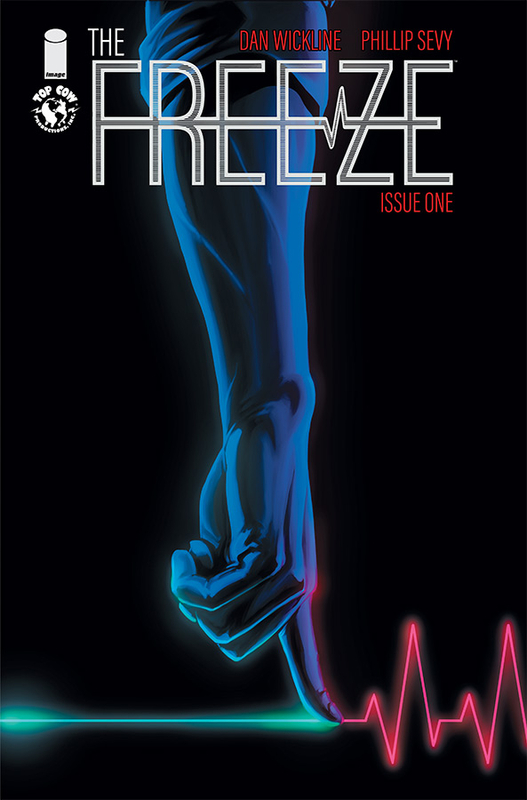 The Freeze #1 is out 12/5. By Bo Stewart — Do you remember that part in the movie Elf when Peter Dinklage’s character talks about an idea that makes you say YES? The Freeze is one of those ideas: what would happen if everyone in the world suddenly froze in their tracks, and only you could fix it. Like all great premises (check out our Prodigy #1 review for another example), The Freeze offers creators Dan Wickline and Phillip Sevy a near-infinite number of storytelling options. The big overarching mystery of why the world froze in its tracks is interesting, but the real draw of the book is the quieter character moments. The premise is deceptively simple. When everyone froze, only Ray Adams was left unaffected. Not only was Ray left unfrozen, but with a simple touch, Ray can unfreeze anyone. The easy story route would be for Ray to run around unfreezing people and restoring the status quo. But there’s more to this book than that. The book makes you think about some tough questions, including how do you pick and choose who gets to wake up? How do you weigh such decisions? Do you wake up doctors or scientists? Which doctors, which scientists? What about your own loved ones? What is the cost of weighing all those decisions? Reminiscent of Y: The Last Man and television show The Leftovers, The Freeze throws its hero headfirst into a world that changed in an instant, a world where he must make those tough choices. The creators use this dynamic to explore some rich thematic territory. Feeling like the world won’t move on unless you, yes you, make it do so...this is fascinating and complex stuff. Every person Ray wakes up literally has a world-changing effect. Ray has to rebuild society from the ground up, and we feel the weight of this realization as it dawns on the characters in the story. Here’s the big question…should Ray bring everyone back? The opening sequence teases Ray in a world of trouble. We know he’s put himself in a tight spot,and finding out how he got there is going to be a fun ride. The art is impressive throughout this debut issue. Depicting lack of motion in a motionless medium is no small task, but, thankfully, the creative team takes what could have been a stumbling block and turns it into an asset. Artist, Phillip Sevy comes up with several creative visual cues as to who is frozen and who is not. Like all of Sevy’s work, this book is gorgeous, but it’s a credit to his talent that it is also clear and easy to follow.